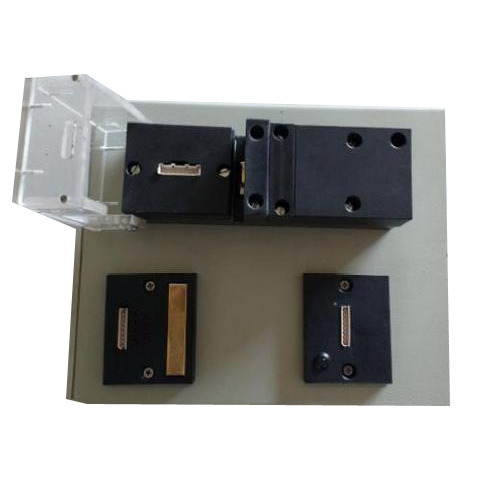 In order to meet the bulk demand of our clients in the industry we are offering a commendable range of Cable Harness Assembly Guide With Continuity Tester. HACT-121 tester is basically used for assembly/testing of harness/Cable with one to one connection. It guides and checks continuity for one to one circuits (cables) during harness manufacturing. HACT-121 supports up to 16 circuits (Cables). Capacity can be increase by connecting another HACT-121 unit. Input voltage 230 V AC, 50 Hz. 10%. Keypad consist of enter key, up key, down key, escape key. Boards check Provision for I/O diagnostic. LED’s to guide where to insert. Piezo Buzzer for Fail sound output. Automatic Locking and unlocking of Fixture. Capacity to test 12 circuits with serial port printing facility. Capacity to test 16 circuits without printing facility. Fixture with From points and To points for continuity. Finds Open, Short in Harness. Finds Okay Harness with LED status. Help to insert wires in to empty coupler by guiding LED’s. Durable and reliable tester for one to one harnesses. Since our commencement in the year 2004, we, Futura Apsol PVt. Ltd., are counted among the enviable organizations, which is engaged in manufacturing a commendable range of Cable Wiring Harness Tester, Cable Harness Assembly Guide, Harness Assembly Aid with Pull, Gauge Link, One to One Continuity Tester, Label Data Storage for Printing Unit, Air Leakage Testing, Dashboard Non Vision Based System and Dashboard Instrument Cluster Tester. The range offered by us is widely demanded in the market for their features like longer service life, high performance, minimal maintenance, easy installation, corrosion resistance and durability. To manufacture the offered range, we have hired a team of dedicated professionals, which is well-versed in this domain. Catering to the exact demands of clients in prominent manner, we have mustered huge customer-base.